As host nation, Russia qualified automatically for the 2018 World Cup finals. It is the first major football tournament Russia has ever hosted; the squad will hope to give its fans something to shout about in their own back yard. Generally, host nations have a good record at their own World Cups. Six, starting with Uruguay at the inaugural tournament in 1930 and most recently France in 1998, won their own tournaments; while two hosts, Brazil in 1950 and Sweden eight years later, were defeated in the final. South Africa remain the only host nation ever not to make it out of the group stage. Despite going behind twice against a near full-strength Spain in St Petersburg, Russia impressively recovered to grab a draw in this November friendly against the 2010 World Cup winners. Although setting up with a back five, Russia’s defence couldn’t stop the unlikely figure of Jordi Alba nodding the visitors ahead from a Marco Asensio cross early on. Sergio Ramos extended the lead, converting a penalty after a Daler Kuzyayev handball in the Russian area – but Fyodor Smolov finished well after a lovely Russian move to give the hosts hope before half-time. They duly equalised soon after the break, as Aleksei Miranchuk tapped home from close range. A second Ramos penalty only two minutes later regained Spain their lead, but Smolov (above) replied once more – his powerful second, the goal of the night, earned his side the draw that suggested they could yet mix it with the big boys. Despite the encouragement of the Spain draw, the reality is that Russia will head into their World Cup without a win in their last seven games. Losses to Brazil, Argentina, and France will have been acceptable to a point, but dull draws with Iran and most recently Turkey – coupled with defeat in Austria – have certainly affected the credibility of this Russia team. Veteran midfielder Aleksandr Samedov put Russia into a first-half lead from a tight angle (below), played in after his front line pressed high in the Turkish half. The hosts continued to press Turkey high up the pitch into the second half, but they struggled to protect central spaces within their high defensive line – and a routine long ball from the Turkish goalkeeper found Yunus Malli free to drive on goal and equalise from distance. Both Samedov and Fyodor Smolov could have won it late on for Russia, but they didn’t – and Russia head to a home World Cup with only five wins from their last 26 matches. It’s not good form. One-club man Akinfeev has represented both Russia and CSKA Moscow between the posts for a decade and more. He made his debut for CSKA at the tender age of 16, saving a penalty and keeping a clean sheet in a 2-0 win, and has been an ever-present for much of the 16 years since. He has won six Russian titles in that time, but it hasn’t all been success – he also holds an unwanted record of 43 consecutive Champions League games without keeping a clean sheet. The 32-year-old (below, left) is the undisputed number one for his country, for whom he has won more than 100 caps and is now captain. A good shot-stopper with a wide range of saves and reflexes, he can be prone to errors. At his sole World Cup to date, in Brazil four years ago, mistakes against both South Korea and Algeria – the latter when he had a green laser shone in his eyes at a free-kick – cost his team points as they exited meekly at the group stage. A goalkeeper who prefers to punch rather than catch, Akinfeev can also be exposed with balls dropped in behind his defenders. Despite having an excellent kicking range off both feet, he rarely strays too far from his line. The youngest player in Russia’s World Cup squad, Golovin has earned many recent plaudits both within Russia and across Europe. 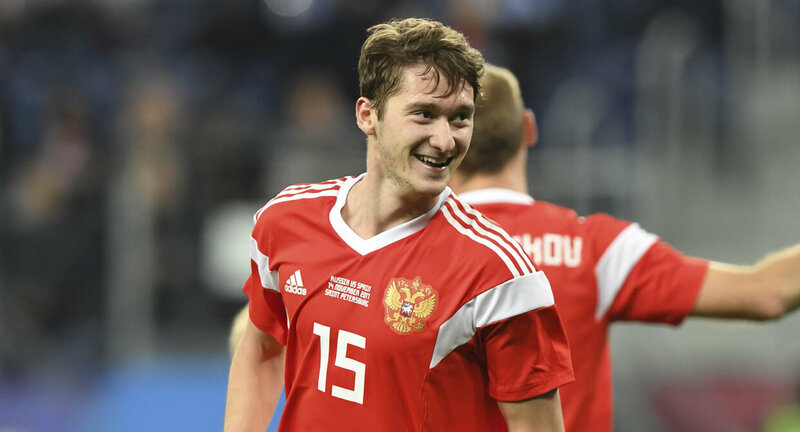 After being thrust into the CSKA Moscow midfield at the age of 18, he has established himself as an integral part in both the CSKA and Russian national team’s central midfield. The 22-year-old (above, right) is set to be the poster boy as his country host the World Cup for the first time. A dynamic force in midfield, he is a fine passer of the ball, comfortable in tight areas and always looking to find supporting runners in attack – all of which were evident in European games against both Manchester United and Arsenal this season. Golovin is accomplished when out of possession, but if a move to any of Europe’s heavyweights does materialise, he will need to improve this side of his game further. He is an active presser of the ball, but can struggle to decelerate when pressing, sometimes losing his man in the process. There is a definite Russian bite in the tackle, however, which may suit teams with a more defensively minded approach. A combination of consistent performances within the Russian league and recent injuries to direct competitors has seen Smolov nail down the central striker role. Despite signing for Dynamo Moscow at a young age, various loan spells in both Russia and the Netherlands confirmed that Smolov’s future was indeed away from the Russian capital. A move to FC Krasnodar materialised, and from there Smolov has proved his attacking worth. He was the league’s top scorer in 2016/17, and finished a close second behind Spartak’s Quincy Promes this year. Despite his club form, critics claim he has yet to truly adapt to the international stage. With Russia likely to deploy Smolov as a lone striker, he will frequently find himself marked or even overloaded by opposing defenders. His movement will have to be well timed to create space for himself, or indeed for others as Russia will heavily rely on runners from midfield. A good finisher and composed in front of goal, he is by no means prolific – but he will still be the central focal point of Russia’s attacks. 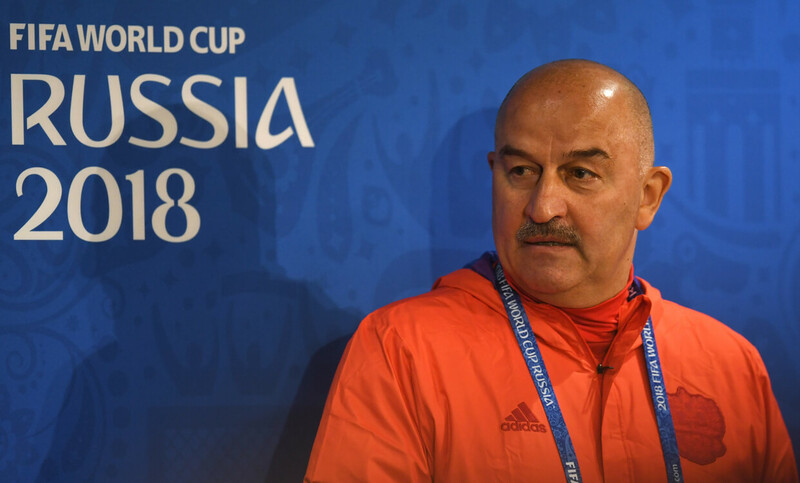 Cherchesov took over as Russian head coach in August 2016, after Leonid Slutksy had overseen a dismal campaign at Euro 2016. The former goalkeeper, an international for both the Soviet Union and Russia, has previously managed domestically in both Russia and Poland. As a player, Cherchesov mainly represented clubs in his native Russia, with brief spells in both Germany and Austria in the latter years of his playing career. His lone appearance at a World Cup was in a 6-1 victory over Cameroon in 1994 – a game more famous for Oleg Salenko’s five goals. Having started his coaching career in Austria, Cherchesov returned to Russia and managed a number of clubs – including both Spartak and Dynamo Moscow – before having his most successful season with Legia Warsaw in Poland. After securing a league and cup double, he moved to take the Russian job. The 54-year-old took over a team and squad low on morale. Scrapping the back four they had used in recent years, Cherchesov converted the defensive unit into a back three with some initial success. However, a recent dip in form has seen Russia only win once in their past eight matches – and the head coach has turned his back on a back three in his last two friendlies against Turkey and Austria. Is this a sign that, after two years, Cherchesov is still unsure of his preferred formation? Since Cherchesov took over in 2016, a lack of defensive consistency has been apparent, particularly in the central areas. In 20 games since their elimination in France, Cherchesov has used 10 different players in the central defender role. With goalkeeper Igor Akinfeev the only real consistent presence, it is no surprise that Russia have not kept a clean sheet in their last 10 matches – and the chopping between a back three and back four in recent times may not help in a group in which Luis Suarez, Edinson Cavani and Mo Salah lurk. With Akinfeev largely unwilling to stray too far from his line, whichever formation Russia play could be exposed by delicate balls in behind the back line – although they have also had trouble tracking runners in between full-back and centre-back (below, left). The lack of strength in depth when it comes to defensive midfielders may be a related issue; Cherchesov has often favoured Denis Glushakov in the role, but left the Spartak man out of his final squad. The lack of options in the central striker role for Russia does mean there is more room to include extra attacking midfielders. 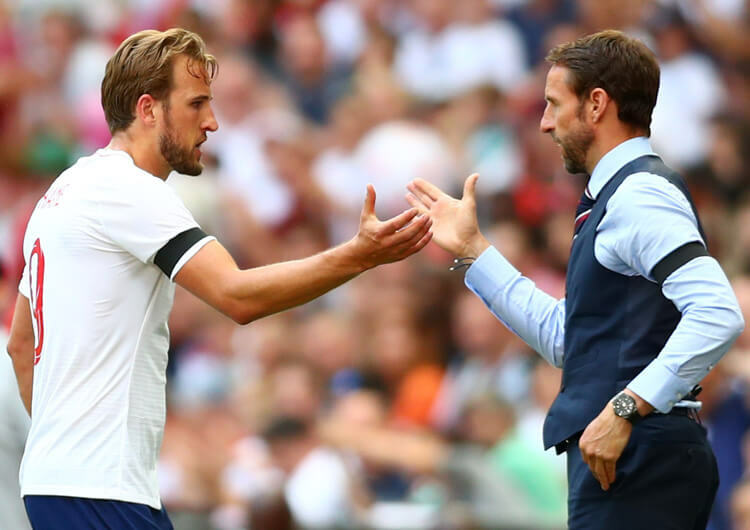 Late runners will be required to support the likely lone forward, but there will also need to be a defensive awareness – ideally stopping opponents from splitting the back line in the spaces between centre-back and wing-back. Aleksandr Golovin and Roman Zobnin are likely to play a big role in supporting the wing-backs as they push forward (above, right). They will provide immediate defensive cover, particularly if the wing-backs have pushed on in attack. Russia will certainly not want any of their three central defenders to be drawn too far away from the central lane of the pitch, particularly against fast and direct opponents. When in possession, Russia will rely heavily on the movements and creativity of Alexei Miranchuk. The young Lokomotiv Moscow midfielder will look to drift in between the lines as Smolov tries to run and penetrate in behind. Russia are unfortunate to be missing their main forward threat in Aleksandr Kokorin. The Zenit St Petersburg striker was in fine form in the early stages of the Russian league season, but a cruciate ligament tear in a Europa League tie against RB Leipzig cost him his World Cup. 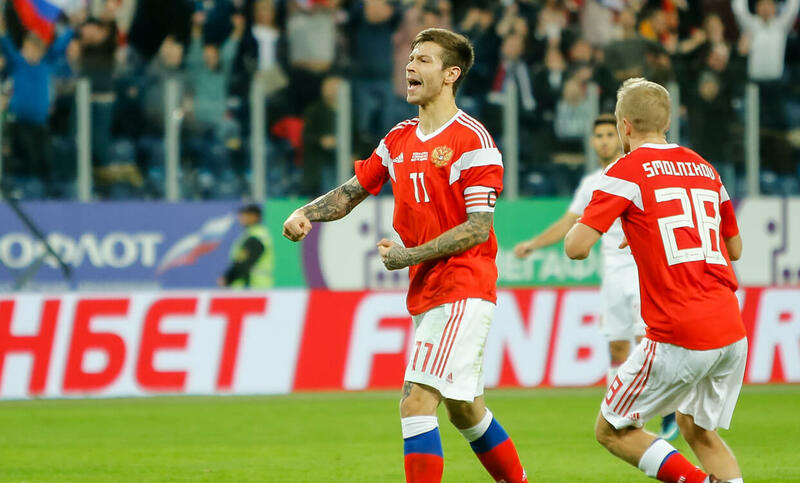 Fyodor Smolov is a capable replacement who actually offers more in terms of bringing midfield runners into the game around him, but he is yet to really shine on the international stage and the back-up is not convincing. Alexei Miranchuk (above) is an option, but he will be deployed in his preferred attacking midfield role. 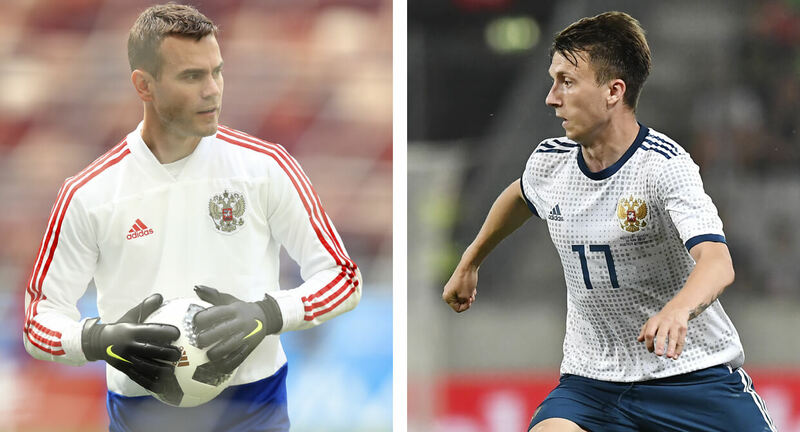 The more likely alternative would be Artem Dzyuba, who Roberto Mancini deemed surplus to requirements at Zenit last season – but Dzyuba can be a brash character who may not be entirely to the taste of Cherchesov, who himself has a history of falling out with his players. The squad’s proliferation of midfielders does lend itself to the use of a false nine as part of an attacking diamond, but that would necessitate a more conservative approach from the wing-backs – if they moved too high alongside an attacking quarter of midfielders, the Russian defence would be left even more vulnerable than they already are. In essence, the question is whether this squad boasts enough firepower to make up for its defensive shortcomings.